Found in homes and hospitals, bedpans and urinals are practical aids for bedridden persons who cannot get up to use a toilet. Over time ‘male’ and ‘female’ designs evolved that increased a patient’s comfort and ease of use. Until the mid-twentieth century, student nurses training in hospitals had the necessary, but unpleasant job emptying and sterilising bedpans. 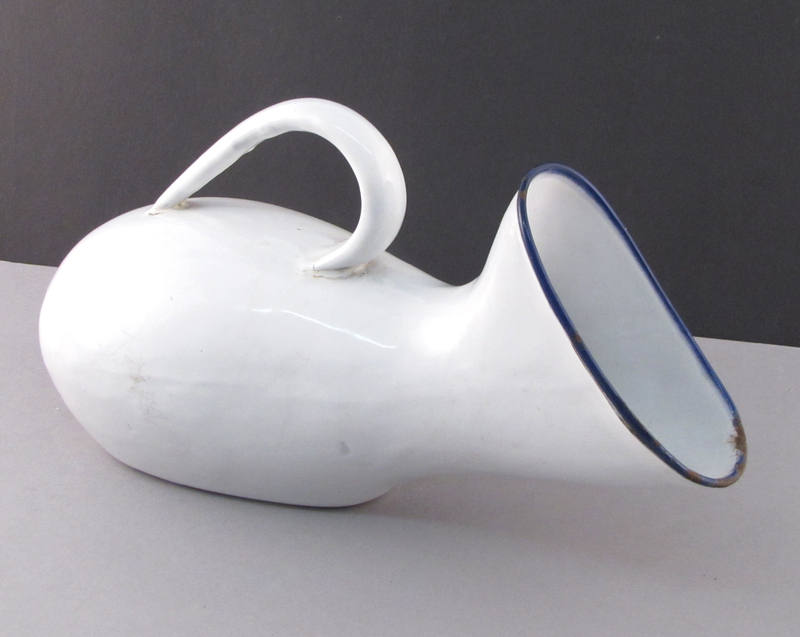 Before the late 1800s, bedpans could be made of pewter or brass and sometimes urinals were made of glass. Porcelain, china, and pottery were other materials employed. By the early 1900s, medical supply catalogues offered lighter weight enameled metal utensils and by mid-century, stainless steel. The switch to plastics and other disposables took place in the 1960s. This female urinal was owned by a doctor in Gananoque, Ontario.